Also available from this page are compressed files of the complete final report. "County government is often dismissed as a weak link in the management of the nation’s land resources. Poorly funded, understaffed and politically vulnerable, counties have been regarded as easy marks for the one-size-fits-all projects of well-heeled developers and the ill-considered schemes of local cronies. "Then, as if to counter such cynicism, along comes an effort such as the Community Character Plan for Collier County, Florida, which demonstrates the potential for integrated planning at the front lines of battles over sprawl, traffic, ecology and social equity. "Most significantly, the Collier plan interprets the public realm as including not only streets and urban open spaces but also systems of habitat and waterflow, as well as traditional patterns of rural life. Within this context, it tackles a range of contemporary physical planning issues, such as creating a better-balanced transportation system, retrofitting introverted subdivisions, transforming arterials into great streets and helping inner-ring suburbs age gracefully." Click here to read the full article which announces the "2002 Place Planning Award" granted to this plan by the Environmental Design Research Association. 2. Choice… Provide more housing choices in Collier County by reintroducing walkable traditional neighborhood development as a counterbalance to the multitude of gated subdivisions that have been built over the past 20 years. 3. Balance… Create a balanced road network by improving Collier's principal arterial roads while simultaneously creating a secondary network of smaller roads that link neighborhoods. 4. Connections… Make frequent connections between new neighborhoods and the land around them, and fully integrate them with the secondary street network and with parks and other urban open spaces. Improve existing neighborhoods in the same way. 5. Growing smart… All new development approvals should be based on a resilient pattern of streets and lots, because the initial street and lot pattern will long outlast the first generation of buildings and land uses that are placed on them. 6. Hold the line… Make much better use of the remaining vacant acreage within the existing urban boundary before allowing new development to creep further into the countryside. 7. Respect environmentally sensitive places… Enhance the character of Collier's more rural and environmentally sensitive places through rural design techniques and further protection of the County's vital natural resources. 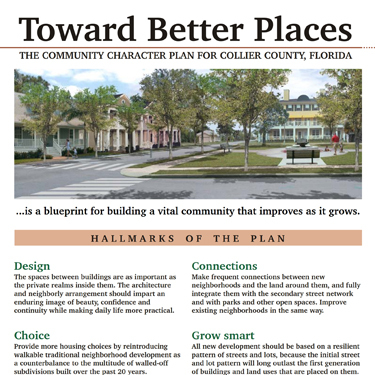 On April 10, 2001, the Collier County Commission accepted "Toward Better Places," their new community character plan. On June 5th, 2001, the Commission held a workshop about implementing this plan. The Commission decided to fund citizen-initiated community plans, then fund specific projects to turn those plans into reality. The Commission has appointed a new Community Character / Smart Growth task force to continue the work of the Select Committee on Community Character. The Commission has authorized a Naples Park Community Plan to carry out the principles of "Toward Better Places." Two other community plans are now being carried out by county staff for Golden Gate and East Naples. Click here for the web site of Dover, Kohl & Partners for detailed information or to obtain the full version of the final report via download or CD. You can now download smaller files of the final report directly from this page. This version contains the complete text and original page layout, but photographs are compressed somewhat to reduce file sizes. Due to the graphical nature of this plan, these files are still large and you may need to be patient during the download period.